You need a functional pair of pants for work, right? Something tough that can stand up to on-the-job wear and tear, but also something professional. These Wrangler Workwear Men's Khaki WP80 KH Canvas Cargo Work Pants do all that and more. These khaki trousers ma ... (see full details) (see specifications) #WRGWP80KH. You need a functional pair of pants for work, right? Something tough that can stand up to on-the-job wear and tear, but also something professional. These Wrangler Workwear Men's Khaki WP80 KH Canvas Cargo Work Pants do all that and more. These khaki trousers may look like Sunday slacks, but they're tough enough for any harsh Monday. A 7.5-ounce canvas fabric weave creates wear-resistant, machine-washable toughness. The combination of 60% soft cotton and 40% durable, quick-drying polyester keeps you feeling good and work-ready all day long. The material is finished for color retention, so it keeps these Wrangler bottoms looking good after they've been through the washing machine again and again. It's wrinkle-resistant and has a soil-release finish that helps prevents stains. These durable trousers are made for on-the-job wear. You'll know it when you move. The inseam is made with a gusset, extra fabric that makes it comfortable for you to squat, bend, lift, climb, and do all that stuff you have to do on the job. Wider and longer belt loops on these canvas pants accommodate work belts. The 13-inch front slacks-style pockets are deeper than many, and they're reinforced to stand up to keys. The cargo pockets feature exterior utility pockets with snaps. The cargo pockets themselves are made in an expandable bellows design to add more storage. Around back, there are pockets on the hip, with a button closure on the left. Styled in a lower rise than most traditional work pants, these khakis are made for a modern fit. Double-needle stitching creates a clean look and adds the strength of two threads, not just one. These Wrangler Workwear Men's Khaki WP80 KH Canvas Cargo Work Pants deliver durable, comfortable style plus functionality tailor-made for on-the-job performance. Order yours right now at Working Person's Store! The Pants are very comfortable. The size runs a bit larger than I expected. Could have ordered a shorter length. The bottom of the front pockets are reinforced for better wear. The only down side was the length of the back pocket is to short. I have to place my wallet in sideways to get it to fit, and it is an average size wallet. 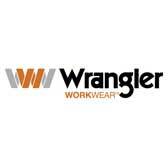 Wrangler Workwear Pants: Men's Khaki WP80 KH Canvas Cargo Work Pants is being added to your cart.